In the centre of the small, sleepy village of Chandor in south Goa lies a 450 year old sprawling Portuguese mansion named Braganca House. Built in the 16th century by the two Braganca brothers, they divided the large mansion into two parts where the brothers lived with their families. The west wing became the property of the Menezies Bragancas and the east wing of the Pereira Bragancas. For anyone looking for a peek into the lives of the landed gentry of the Portuguese era, the Braganca House is probably your best bet. From the ceiling tiles hand-painted by Chinese artists, to the oyster shell windows and the exquisite porcelain plates from Macau adorning the walls. One of the first things that struck me about the interiors was the handcrafted furniture in rose & teakwood. Over 2 centuries ago, Goan carpenters who would come to Braganca House daily to carve, chip and chistle. Their handcrafted work includes intricately carved four-poster beds adorned with the family’s initials and dining chairs that are the exact replica of those, which are now used by Queen Elizabeth in the Buckingham Palace ! While you are in the West Wing of the Braganca House, don’t miss what is widely regarded as the single largest private library in the whole of Goa. 5000 (!!!) books sit on rows and rows of book shelves running alongside the walls. There are Portuguese, English, French and Latin tomes. Shakespeare and Tolstoy sit side by side with the great Classics of Portuguese literature. It is like having the world’s authors next to each other in a single room. In the East end of the Braganca House, the age of the house and the ravages of time are more apparent. In the ballroom, with its Italian alabaster marble flooring and crystal chandeliers from Venice, the ceiling is damp and peeling in large chunks. But it only requires a little bit of imagination to take me back to the days when the aristocracy of old Portuguese Goa glided elegantly across the marble floor. Today, the Braganca House serves more as a storage space for old family relics than as a memoir to the Old Portuguese way of life. In the corridor, sit a pair of ancient tombstones belonging to the Braganca ancestors. Dating back to the 1800s, they were suffering damage in the open graveyard and are now protected indoors. In the corridor also lies a palanquin, that was used by the Braganca ancestors as a common mode of transport. The family chapel also houses what is believed to be a single fingernail of the Jesuit saint and patron saint of Goa, St Francis Xavier. The atmosphere of the Braganca House is one of saudade, the Portuguese word for a feeling of longing for something dear that is now gone. 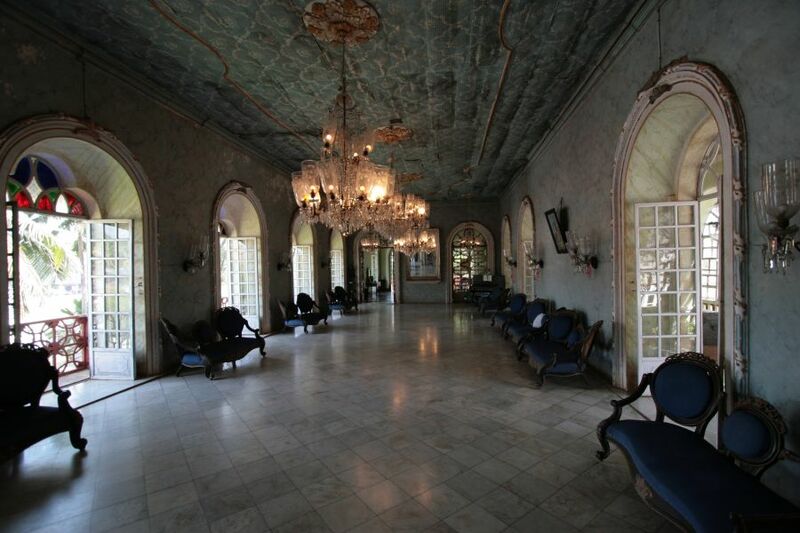 Braganca House represents the last of Goa’s golden era of prosperity. While there is no charge for visiting the Braganca House, a donation of Rs 100 is a welcome contribution towards it’s upkeep. Btw, should I only concentrate on insider secrets or also throw in a few personal posts as well ? P.S. Did you get the blog post I wrote about the Thai restaurant. What do you think of the points I made ? Oh, and how rude of me. If you are ever in India, you are most welcome to be my guest at my Mitaroy Goa Hotel. Looking forward to having you over sometime soon! Previous PostPrevious Dona Paula Beach Goa – A tragic love story !